VeloPress has published the first weight-loss book for endurance athletes. 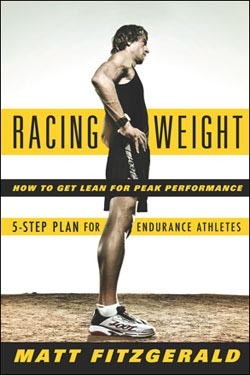 Racing Weight: How to Get Lean for Peak Performance by certified sports nutritionist Matt Fitzgerald offers the first comprehensive and science-based approach to weight management for runners, cyclists, triathletes, swimmers, rowers, and cross-country skiers. A 2009 study found that three out of four endurance athletes are concerned about their weight and half are dissatisfied with how much they weigh. Yet these same athletes ranked weight loss dead last when asked about their motivations for participating in endurance sports. Endurance athletes pursue weight loss as a means to better workouts and faster racing. Fitzgerald's own efforts to reach his racing weight for distance running led him to discover that there were no comprehensive weight-management resources designed for endurance athletes. Using Racing Weight, endurance athletes can find and attain their fastest body weight and composition. The Racing Weight program offers 5 strategies based on the latest advances in the science of weight management. After finding their ideal off-season and racing weights, athletes will learn how to improve their diet quality; balance their intake of carbohydrate, protein, and fat; time meals and snacks; manage appetite; and train for lean body composition. Racing Weight is grounded in the science of healthy nutrition and exercise physiology. Packed with findings from recent studies on weight loss and endurance sports performance, Racing Weight explodes myths about fat and weight gain, protein and muscle building, macronutrient ratios, calorie counting, glycemic index, and weight gain during the holidays and off-season. Athletes will learn the truth about sports drinks, supplements, and recovery nutrition. The book includes daily food logs from 14 elite pro athletes and 21 healthy recipes from nutritionist Pip Taylor. Racing Weight will help endurance athletes reach new levels of performance-and become satisfied with their body weight. Matt Fitzgerald is the author of numerous books on running, triathlon, nutrition, and weight loss. He has been a contributor to Men's Fitness, Men's Health, Outside, Runner's World, Bicycling, Running Times, Women's Running, and other sports and fitness publications. Fitzgerald is a featured coach on Training Peaks and Active.com. He is a certified sports nutritionist (CISSN) licensed by the International Society of Sports Nutrition. He lives and trains in San Diego, California. For more information, please visit racingweight.com. VeloPress is an endurance sports and fitness publisher with books on cycling, triathlon, running, swimming, nutrition and diet, yoga, and the histories and personalities of our sports. VeloPress authors are highly qualified, trusted experts. Our training books help both serious athletes and beginners to build skills and fitness, and our human-interest books inspire greater appreciation of our sports. VeloPress is the book publishing division of Competitor Group, Inc., publisher of VeloNews, Triathlete, Inside Triathlon, and Competitor magazines and producer of the Rock 'N' Roll marathon and half-marathon series and the Muddy Buddy adventure series. For more information, please visit velopress.com.